Over the last couple of years I have been watching Stella Artois’ backing of film with increasing interest, as it has grown into one of the hottest film tickets in town; starting with their immersive live theatre performances that culminated in the audience participation Black Diamond experience, last year Stella Artois gave film fans the chance to win an entire box set of Stella Artois’ favourite films, this year they upped their game and started sponsoring film screenings - starting with the Quentin Tarantino’s Cannes winner Pulp Fiction tying neatly into their ongoing Cannes activities along with their annual The King of Cannes competition, before turning up the heat screening Bart Layton’s indy favourite The Imposter, then they changed the game by hosting one of my favourite and memorable screenings of the year – the UK PREMIERE of the multi textured LCD music documentary Shut Up and Play the Hits. The Establishing Shot: SHUT UP AND PLAY THE HITS PRODUCERS LUCAS OCHOA, THOMAS BENSKI & DIRECTORS DYLAN SOUTHERN, WILL LOVELACE INTRODUCE SHUT UP AND PLAY THE HITS PREMIERE @ HACKNEY PICTUREHOUSE, a photo by Craig Grobler on Flickr. 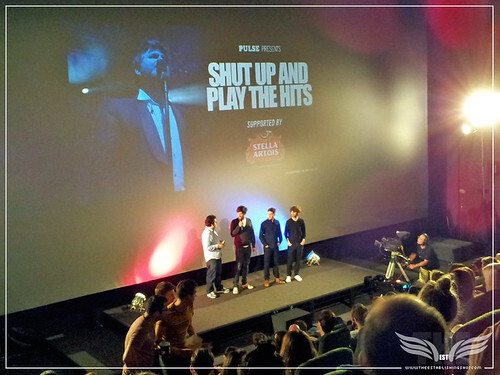 Stella Artois’ Premiere of Shut Up and Play the Hits not only introduced me to both the magic of the Hackney Picturehouse and LCD Soundsystem’s music but I was completely blown away by the Picturehouse’s crystal crisp projection and soul touching sound set up – it was truly of the highest caliber! The screening was only topped by the cheeky pint in the Picturehouse bar afterwards alongside the guys from LCD Soundsystem, Hot Chip, The Klaxons, Bombay Bicycle Club and loads of others from fashion, film and music whilst chatting film with Director Dylan Southern before he roped his mates into dancing what can only be described as a burlesque jig – magic times. Stella Artois followed that up with a preview of Looper easily the best Sci-Fi film of 2012 and whilst the picture and sound quality of the Hackney Picturehouse were again absolutely superb there was sadly a noticeable lack of burlesque jig dancing. Stella Artois are aiming to bring the magic back next week on Monday 26 November when they host the UK Premiere of Ben Wheatley’s darkly comic Sightseers and offered fans a chance to be part of the magic as London Transport Museum plays host to a star-studded premiere and pre-drinks reception for the home-grown British film. Stella Artois’ support for the film is part of an established heritage which celebrates the art of film making. The screening is the fourth installment of a series of events supported by the Stella Artois bursary scheme, which has been set up to support stand-out film events in partnership with Picturehouse Cinemas. The exclusive premiere will take place at the London Transport Museum on Monday 26th and movie enthusiasts can enter the competition via the Stella Artois UK Facebook page – the online home of the Stella Artois Cannes Cinema Club, a unique online hub bringing to life great moments in film. To be in with a chance of winning, fans can click on a dedicated tab at the top of the Stella Artois UK Facebook page that will direct them to a short entry form and multiple choice questions. They will then be entered into a prize draw that will be live from Friday 16th November and run until midday on Tuesday 20th November. The winners will be drawn and notified by Friday 23rd November. Produced by the brilliant Edgar Wright and written by its cast, ‘Sightseers’ is the third film from award-winning director Ben Wheatley, which follows Chris, played by Steve Oram, as he takes to the road to show Tina (Alice Lowe) his world from the Ribblehead Viaduct to the Kewsick Pencil Museum and beyond. As events begin to conspire against the couple, and litterbugs, noisy teenagers and Tina’s meddling mother begin take their toll, it’s not long before their dream begins to crumble, sending Chris and those who dare to cross him into a whirlwind of doom. The Stella Artois bursary scheme kicked off with a UK preview of Bart Layton’s highly anticipated real-life thriller ‘The Imposter’, and was followed by an exclusive screening of ‘Shut Up and Play the Hits’, a film that follows LCD Soundsystem’s frontman, James Murphy, through his final showdown gig at Madison Square Gardens. The latest preview took place in September, with futuristic action thriller ‘Looper’, starring Joseph Gordon-Levitt and Bruce Willis. 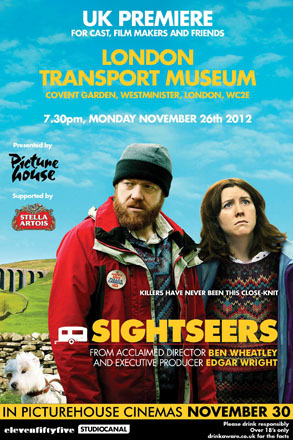 The Sightseers Premiere will take place at The London Transport Museum, Covent Garden, London.